Okay, seriously: What in the actual effing eff are the Chicago Bulls doing. The point guard rotation is a mess. Jimmy Butler and Dwyane Wade seem like they hate everyone else on the team. Head coach Fred Hoiberg is being criticized for not generating more shooting from a roster that isn’t built to shoot. The front office clearly needs to do something to salvage the situation, lest Chicago fall out of the Eastern Conference’s playoff bubble and face even more pushback from pundits and fans. 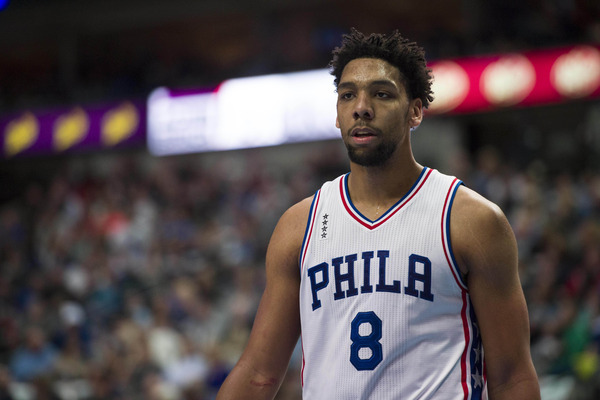 So, obviously, it’s time for the Bulls to acquire Jahlil Okafor. The Bulls have been active with the trade deadline approaching, and they’ve inquired about the availability of Philadelphia 76ers center Jahlil Okafor, multiple league sources tell CSNChicago.com. So far, there’s more interest on the Bulls’ side than the 76ers’ side, according to sources, but the Bulls are interested in Okafor’s services. Because salaries have to match and Okafor is on a rookie-scale deal, one wonders how it can work if the 76ers aren’t enamored with some of the Bulls’ young players who’ve yet to fully blossom. The Bulls could conceivably open up talks to a third team if need be, considering it isn’t likely they’d want to part with any future first-round picks as they’re still deciding how they are to proceed with franchise direction in the next couple seasons. Okafor represents almost everything the Bulls don’t need. He can’t space the floor, is woefully disadvantaged on the defensive end, and hasn’t developed into an exceptional passer. Sticking him next to Butler might help cover up some of his defensive warts, but he isn’t going to drum up the team’s offensive appeal one bit. Perhaps the Bulls’ interest—lukewarm as Goodwill notes—is borne from convenience. Okafor doesn’t look like he’s a long-term fit for the Philadelphia 76ers with Nerlens Noel and Joel Embiid playing so well, and it’s only going to get harder for him to crack the rotation once Ben Simmons joins a frontcourt pileup that also includes Richaun Holmes, Dario Saric and Ersan Ilyasova. At only 21 years old, Okafor does present some intrigue if the Bulls can buy low. They appear destined to lose Taj Gibson in free agency, and they don’t see particularly in love with Cristiano Felicio or Bobby Portis. Okafor is an inferior defender to them all, but if the Bulls can take on his rookie-scale deal—which won’t demand he get a raise until restricted free agency in 2019—it’s not a terrible idea for them to take a long-haul flyer. Especially if their plan following this season’s epic letdown is to begin a full-scale teardown.